We extend our warmest, heartfelt thanks to our donors who have supported us with monetary, equipment, supplies and service donations as well as our wonderfull volunteers who give so freely of their time, love and compassion. Joan,Ray Ananiew,Selock In Memory of "Blue"
M/M Ricky Barnes In Memory of "Anthony (Tony) Rivino"
donated monetary support-for the aviary. donated Time on Fathers Day in honor of her father. Barbara Bush In Memory of "Mahala"
Barbara Bush In Memory of "Kiwi"
Gerald & Joan Cavanagh In loving memory of "George J Dorn,Jr"
Joanne,Molly,Ziggy,Honey & Spooks Chiavacci In loving memory of Simba the "Big Kitty"
Franc & Brad Coker In loving memory of Hank Winter & his little blue truck! Franc & Brad Coker In Memory of "Dominica & Black Bart" of Pet Galley- they will be missed! for Fred & Dolores Parsons Coker,Franc & Brad In loving memory of "Berry"
Karen & Tom Collins In Memory of: Arnold- the sweetest pig ever! Karen,Tom,Susan & Al Collins & Gauthier In Loving memory of Arnold- the best pig ever! Daryl Cook In memory of: Helena Von Steenbeeck "Mama Helen"
Gail & Ronald Crooks In loving memory of "George Dorn"
Barbie Culbertson In memory of "Silky"
Dorothy Essex In Honor of Hank Winters 92nd Birthday! Meredith Essex In Honor of "Hank Winter"
Cindy Fini In Memory of "Floyd & Karey"
Susan & Al Gaither In Memory of: Arnold- the sweetest pig ever! donated donated for Stars care. donated Use of horse trailer when needed. James & Carmen Holt In Memory of: Arnold- the sweetest pig ever! M/M Ron Hufford In Memory of "Anthony (Tony) Rivino"
Grayson Jackson In loving memory of "our Eddie boy"
Jane & Christopher Jackson In Memory of "Ed the dog"
William & Grayson Jackson In Memory of "Millie Estridge"
donated monetary support for Loki. M/M Robert Johnson In Memory of "Anthony (Tony) Rivino"
Judith Kuenzle In Memory of "Anthony (Tony) Rivino"
M/M John Matthews In Memory of "Anthony (Tony) Rivino"
donated Monetary Support- in 2014. Aloma McDowell In Memory of "Anthony (Tony) Rivino"
Barbara McFarland In Memory of "Rocky"
Cynthia & Ron Morris In Memory of "Anthony (Tony) Rivino"
Zelda Nichols helping the animals in all kinds of ways! Robin & Calvin Oflanagan In memory of "Sammy Vereen"
Rosanne Peterson In Honor of "Nancy Kazersky"
Diane Rastello In Honor of "Putter"
Margie & Arnie Reisfeld In Memory of "Anthony (Tony) Rivino"
Anne Rogers In honor of " Beryl Oberst"
donated monetary support-2008/09;10 & 2011. Terry Senior In Memory of "Dominica & Black Bart" of Pet Galley- they will be missed!! donated monetary support for 2012. Edward J Skotnicki "In his Memory"
donated mower & mower trimmer. John St.Clair In Honor of "Hank Winter"
Monica,Mary & CJ The Moore Family In loving memory of a wonderful friend "Duke"
Sandra Thomas In Memory of "Sandy Bellamy"
donated monetary support for 2016. Megan Tracy In Memory of " Doobie"
Don & Sandy Trott In Memory of "Sharon Stalberg"-who loved animals! Don & Sandy Trott In Memory of Grant Honeycutt- who loved animals with a passion! donated monetary support for the sugar gliders. Maria Wiemken In Memory of "Scott Oster"
Katherine Wilkinson In Loving Memory of "Muriel"
Karen Yaniga In loving Memory of "Linda Dhalle" one who loved animals!! donated Donations and Moral Support. donated food for the animals. 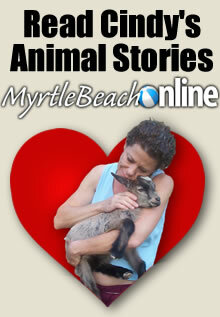 Critters Magazine Bonnie Scrudato thank you for always thinking of our animals! 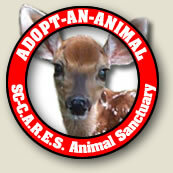 donated space in Critters for info on SC CARES. 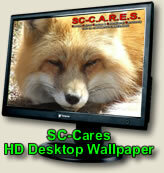 donated Gives discounts to customers who support SC CARES. donated deep discounts on building supplies. Fungi Perfecti Mushrooms are amazing! donated Reishi mushroom for the animals. Handy Hands Lawn Services This is caring, giving company ! Wonderful people! 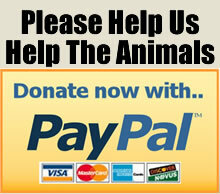 Jarden Animal Solutions Thank you so much for your generosity & for caring about us! Liberty Terminals Thank you for helping these animals! donated delivery of sand for 2nd barn. Low Country Companion In Memory of "Millie"
donated 4 stroke String Trimmer. donated Super Hero Sponsorship for Sassy. donated lumber at deep discounts. donated shipping of our fence. Pharma Chemie Thank you so much for caring about these animals!! donated Lots of Phycox for the arthritis sticken animals!. Prima Tech Thank you for helping us! donated latex gloves for meat prep & cleaning. donated 10% of a sale-when SC CARES is mentioned!. donated their Hi-tensile Wildlife fence that is the only fence we use..
donated discounts on building supplies. Dalton Floyd & Family The Floyd Law Firm In Loving Memory of "Nova"
The Golden Egg Pancake House In memory of "George J Dorn,Jr "